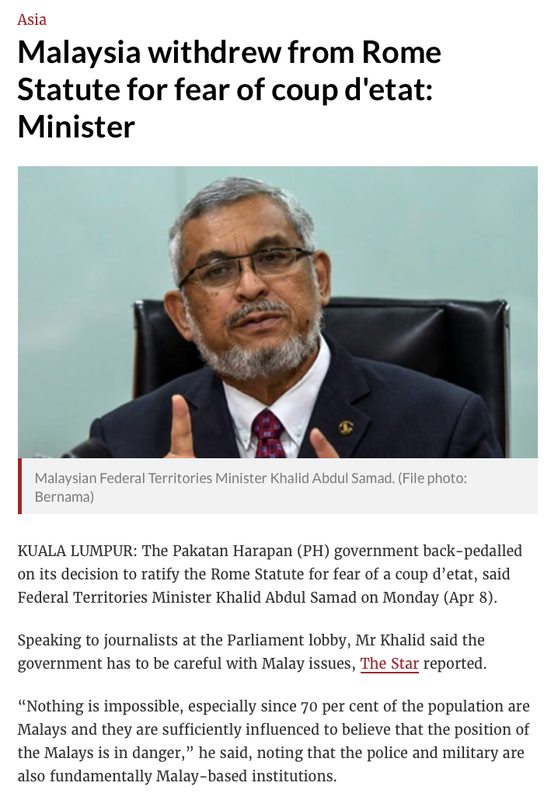 Bangsar, 10 April: I didn't plan to blog again on Khalid Samad after my last posting h e r e but this Minister's coup d'etat statement re the Government's big U-turn on the Rome Statute is so damn frightening that it would be a sin as a Malaysian not to tell him off. This is fear mongering at its worst. 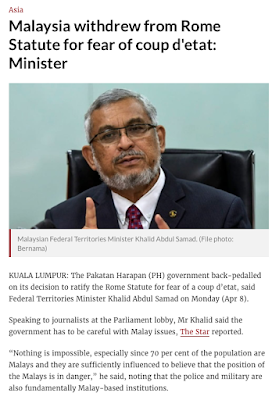 The coup d'etat statement (read full story here) is an insult to us peace-loving Malays and a baseless and dangerous accusation against the "fundamentally Malay-based institutions" which are the police and the military. You are saying that they were about to commit treason. Clearly, the Minister didn't have the full facts (which is why he should have just shut his gap). And we would be none the wiser, too, if Umno sec-gen Anuar Musa had not shared the facts of the matter with us in this ceramah at Rantau, Negri Sembilan.